Accelerometers are designed to measure acceleration in a particular direction. 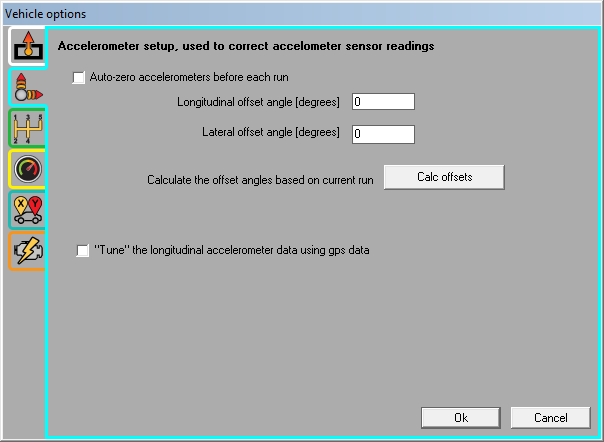 So to measure accelerations accurately it is essential that the logger or meter is accurately aligned in the car. In practice, this means that the unit must be mounted squarely in the vehicle and as level as possible. More details about mounting can be found here. "auto zero" the accelerometers at the beginning of the run. manually fix the mounting angles and "hardcode" this into the analysis. If auto-zeroing is enabled, then the analysis software assumes that, for the first second of each run, the vehicle was standing stationary on a level surface and uses this information as a basis for calculating the mounting angle. This information is then used to correct the accelerations for the entire run. If there are multiple runs loaded into the software then this offset will be calculated for each individual run and applied only for that run. The second method of entering angles manually obviously requires that you know the angle that the unit is mounted at. The simplest way of doing this is to park the car stationary on a level surface (or as near as possible) and log a few seconds of data. Disable the "auto zero" option in the analysis software and load in the data. With the data loaded and processed click the auto calculate option to automatically calculate the mounting angles. Once this has been done these mounting angles can be used for subsequent run analysis and the angles will remain valid unless the unit is moved. Note that this method calculates the angles based only on the first second of the first run that is loaded - all other data that is loaded has no effect on the result.